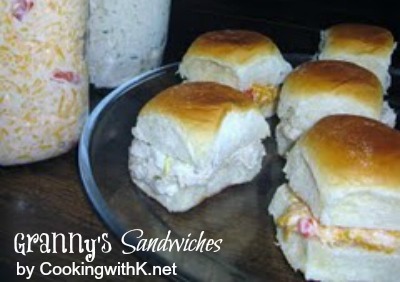 Homemade Pimento Cheese and Homemade Chicken Salad are the favorite salad to make sandwiches. Pick out a favorite bread, and you can have the perfect sandwiches for any gathering. I was thinking this past Wednesday about what dish I was going to take to our Sunday evening Life Group meeting, when I thought about August is National Sandwich Month, and what better time to take sandwiches. Chicken Salad and Pimento Cheese are some of my favorite sandwiches. When I was growing up, my mother only used Miracle Whip Salad Dressing, and my husband's mother also only used Miracle Whip Salad Dressing. When we got married, he requested that we start using mayonnaise. I transitioned over the years to mostly using mayonnaise, but I still get hungry for that taste of Miracle Whip in my mother's Chicken Salad and Pimento Cheese recipes. Although, if you are not a fan of Miracle Whip, by all means, use mayonnaise in both of these recipes. They are delicious either way. As someone said, a sandwich is not a great sandwich unless it has a fantastic spread on each side of the bread. I noticed when making the Chicken Salad that my mother's recipe called for using a meat grinder for the chicken, today I have a food processor that I use instead. Mother used a hand grater to grate the cheese herself for the Pimento Cheese. Today we have the luxury of buying already grated cheese, I know the taste doesn't change, but sometimes, I will hand grate my own cheese and relive those days growing up. When I got ready to take a picture of these sandwiches, I remembered once each summer mother would have a huge yard sale at our house, and she would always make Chicken Salad and Pimento Cheese. I also remember her putting the Chicken Salad and Pimento Cheese in what she called "fruit jars", and we would spoon out what we needed for our sandwiches. It was a quick way to make a sandwich and get back outside in between the people coming to buy things. Sweet memories start flooding in every time I make her recipes. 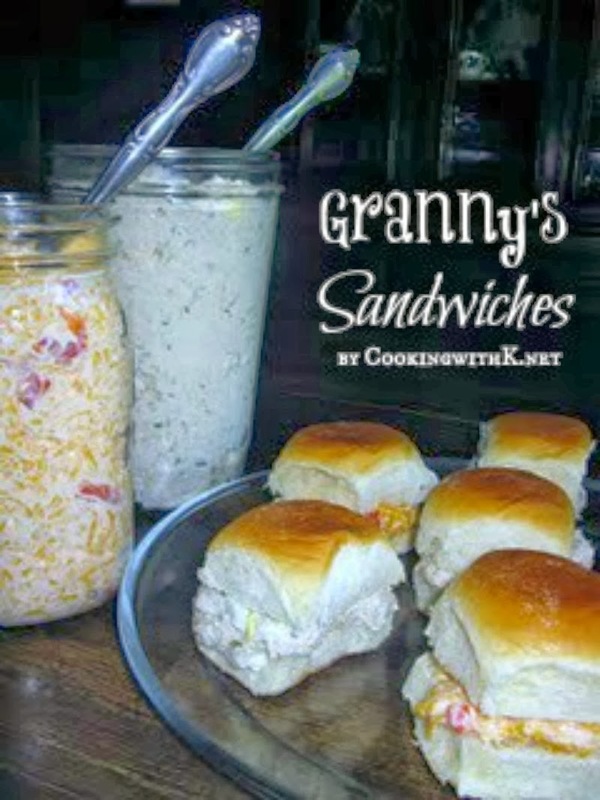 I couldn't resist taking a picture of the Chicken Salad and Pimento Cheese in "fruit jars". Hope you enjoy these recipes. 1 whole chicken, broiler-fryer, 1 ½ to albs. Place chicken in a large stockpot; add water, salt, and pepper. Bring to a boil; reduce heat; simmer 1 1/2 hours or until done with meat coming off the bone easily. Remove chicken from broth and set aside to cool to the touch. Remove meat from bones discarding the skin from the meat. After meat has been deboned, grind meat in a food grinder using the medium size disk (I use my food processor using the cutting blade to do this step now). Transfer chicken to a medium size bowl, cover; place in refrigerator to chill for 1 hour. Add pickles and onion to chicken; mix thoroughly. Add salad dressing mixing well. Salt and pepper to taste. Fold in the eggs last to keep from mashing them to much; mix lightly but thoroughly. Cover; refrigerate until ready to serve. Serves 8-10. Note. Be sure and drain pimentos well, this keeps the Pimento Cheese from becoming watery in the refrigerator.